This week on Dispatches from the field, we are excited to welcome back Rachael Bonoan to tell another story of her fieldwork adventures! Except this time instead of working with honey bees, she’s searching for ants and caterpillars. Don’t miss out on the links to her own blog! It’s 6:32 on Saturday morning. Half awake, I hear my phone buzz. Someone emailed me. Do I dare look? I kind of want to sleep in, but once I check that email, I’m awake…I decide to check it. “Flight into WRONG city…” reads the subject line. The email is from my new boss regarding a flight I’m taking in two days. Fresh off defending my PhD on honey bee ecology, I’m about to begin a new adventure doing fieldwork in the Pacific Northwest. My new field site is south of Seattle, WA so I’ve booked a flight from Boston to Seattle. Turns out my new boss, and the campus where I’m based, are actually nearer Portland, OR. I immediately call Alaska Airlines. I can’t change my flight, but I can take a connecting flight from Seattle to Portland. I’m embarrassed by my oversight, but eager to get started on the new job. After a slightly frantic day of packing on Sunday, my husband drops me off at Logan Airport with two bags and an appetite for adventure. The flight from Boston to Seattle is not pleasant: cramped, turbulent, and long. But after a short layover later I’m back in the air. In my window seat I’m actually happy about the ticket mishap. From the small plane, I’m awed by the landscape below. Everything is so green! After a long winter in Boston, I am quickly falling in love with the Pacific Northwest. Finally, I make it to Portland. My new boss drives me to Washington State University, Vancouver. Again, my eyes are glued to the green landscape. Everything is so alive! I cannot believe I get to spend the summer in this beautiful new place, studying butterflies and their relationship with…ants! 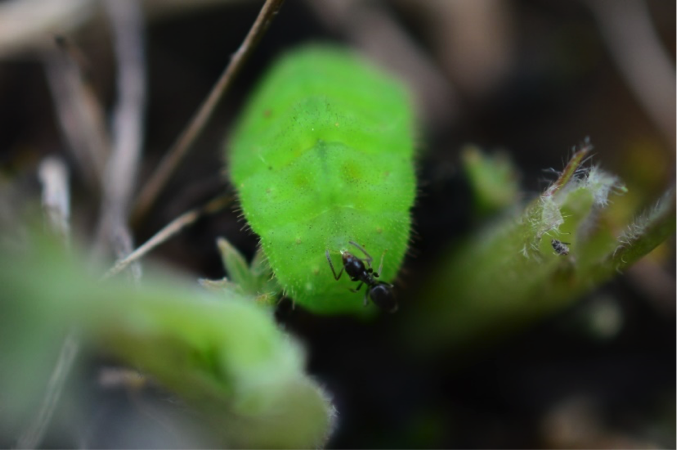 Ant getting a sugar-reward from a Puget blue caterpillar. There’s a group of butterflies, called Lycaenids, that are protected by ants when they are caterpillars. When the caterpillars feel threatened, they call for help using sound, scent, or both. This signals for the nearby ants to come to the rescue. Once danger has passed, the caterpillar “thanks” its protector(s) by secreting a tiny sugar droplet from a specialized gland near its bottom. The ants lap up the sweet (and likely nutritious!) treat. Nature is incredible. My new job is to study the natural history of this relationship in the at-risk Puget blue butterfly. The Puget blue butterfly is only found in the South Puget Sound, WA (hence the name) and British Columbia. I am so excited! Puget blue butterfly getting a snack from oxeye daisy. 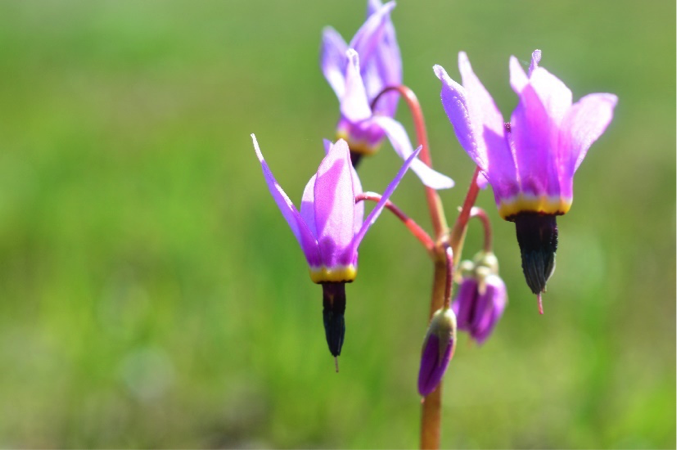 One of my favorite wildflowers on the prairie, shooting star. After a couple weeks in Portland, I get out into the field in late April. 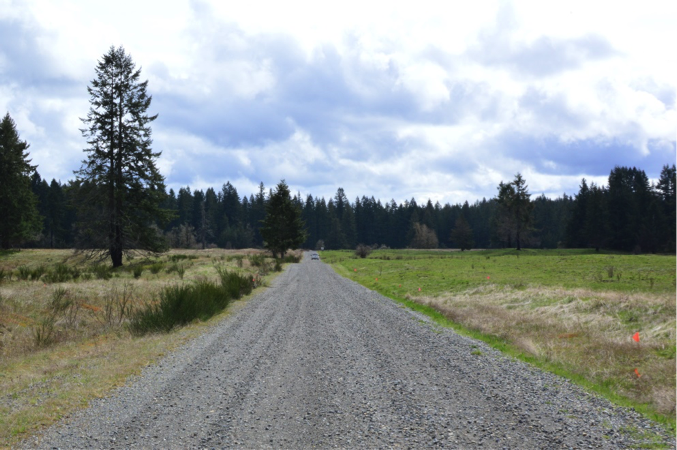 Just south of Olympia, WA, my new field site is a lively 180-acre prairie. There are queen bumble bees searching for nests, barn swallows doing acrobatics, and some of the strangest flowers I have ever seen. I half expect the Alice-in-Wonderland-esque flowers to break into song. With a deep breath of the fresh prairie air, I set my focus on my research. Although this is a new study system, I have read everything about ants and caterpillars I could get my hands on. I feel ready. Besides, I’m a behavioral ecologist. Whether it’s honey bee foraging or ants taking care of caterpillars, I study behavior. I’ve got this. First step: find the caterpillars. On hands and knees, I start my search. The Puget blue butterfly only lays its eggs on one species of plant—sickle-keeled lupine—which somewhat narrows down my 180-acre hunt. Yet, after three days of combing through lupine, I have only found two caterpillars. Yikes. At their largest, Puget blue caterpillars are only about 15 mm long. And they’re green—just like the plant they hang out on. Green, just like everything else in the Pacific Northwest. Suddenly, I’m not quite so enamored with the green landscape around me. On the edge of panic, my thoughts begin to spiral: this is all my fault. I am a terrible scientist. I can’t even find my study system! But then I remind myself that it’s too soon to panic. Instead, I call for reinforcements: Cameron. Cameron did his master’s thesis in a similar system and is essentially a professional caterpillar finder. Together, Cameron and I continue combing the prairie for the elusive Puget blue caterpillars. After two more days, Cameron gives me the news. It’s not me, it’s the caterpillars. Sigh of relief. Sort of. Turns out, I’m not bad at finding caterpillars. My timing is just off. By the time I got out here, the caterpillars were underground in their chrysalises, becoming butterflies. Needless to say, I can’t study ant-caterpillar behavior this field season. I’m disappointed that I can’t study behavior this field season, but thankfully, I have two more seasons ahead of me. After consulting the literature, and wandering around the prairie, I decide on a natural experiment. About half of the field site was burned in an arson event last fall. Though unfortunate, it gives me the chance to study how burning, a typical management technique, affects lupine growth and the ant community on the prairie—both important aspects of my new study system! Field season salvaged. My field site in spring, following a fall burn. The greener right side of the road was burned while the browner left side was not. Hanna collecting data on lupine size. This species of lupine has purple cone-shaped flowering stalks. Thankfully, my undergraduate intern, Hanna, arrives just in time to help with data collection! For the eight weeks that follow, Hanna and I wrangle lupine plants to track size and growth. We count the number of stems and the number of flowers on each plant. And we sneakily follow butterflies around the prairie to see which flowers they prefer to drink from. We also put out pitfall traps (small tubes in holes in the ground) to collect ants. With 216 traps to put out and collect every other week, Hanna’s help is much appreciated! This coming fall, we will work to identify the ants to see if some may be affected by the burn more than others. Though I’m just getting started, I’m excited to spend my next couple field seasons exploring how ants affect Puget blue caterpillar survival and thus, the population of this at-risk pollinator. 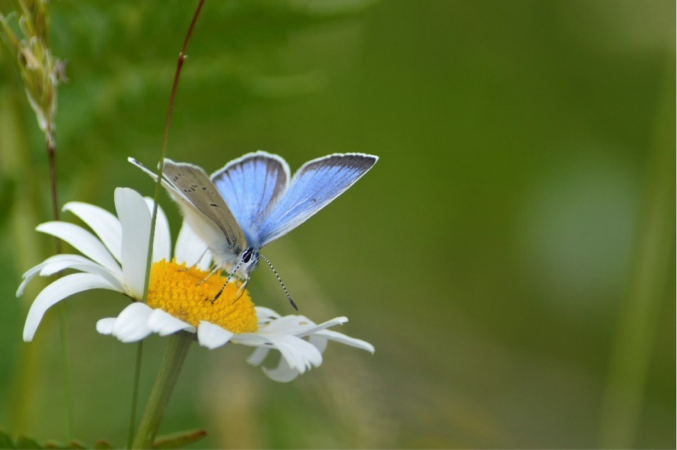 With a couple more successful field seasons, we can help guide conservation efforts for this at-risk butterfly as well its endangered relative, the Fender’s blue butterfly. I love my job. 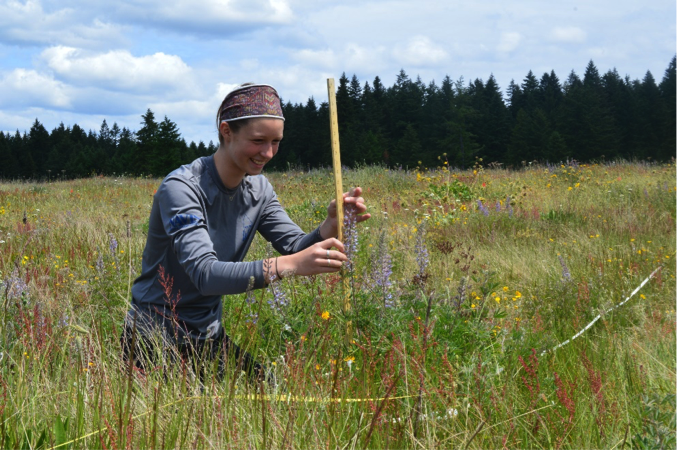 Rachael is a post-doctoral researcher in the Crone Lab (Tufts University) and the Schultz Lab (Washington State University, Vancouver) studying ant-caterpillar interactions in the South Puget Sound, WA. She recently defended her Ph.D. research on honey bee behavioral ecology, nutritional ecology, and ecological immunity in the Starks Lab (Tufts University). She is passionate about ecology, social insects, and insect pollinators!